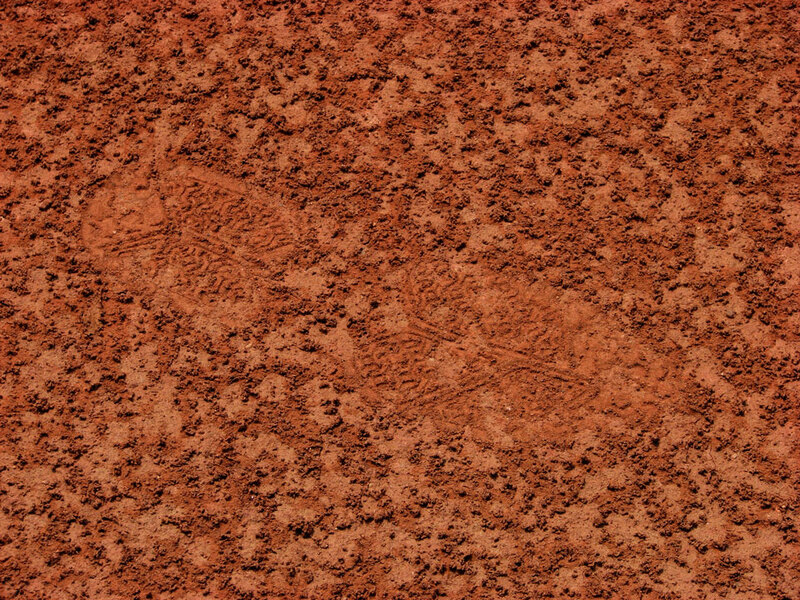 Dorothy Current (b. 1917) was a neighbor of the Frick clay courts when they first opened in 1930, and came to play on them with her friends when she was in high school. 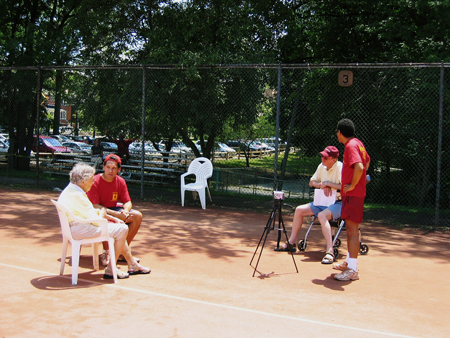 Dorothy is still a tennis fan, not missing Federer's or Nadal's matches on TV, and she made a special visit and shared her stories with us at the Frick Clay Court on June 22nd, 2008. 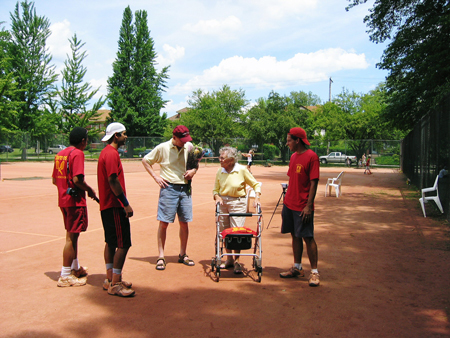 From L to R: Karl Franklin, Gulshan Sharma, Tom Current, Dorothy Current, Jose Mieres (Photo by Maureen Collins). 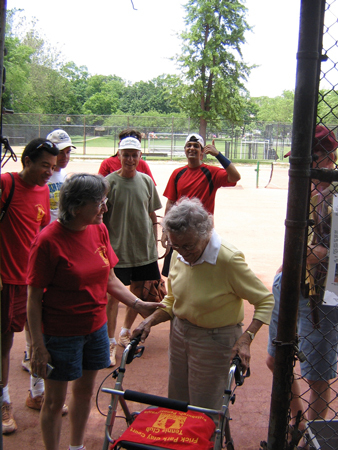 Dorothy Current (L) tells us her experiences at the Frick Clay Courts. (Photo by Maureen Collins). 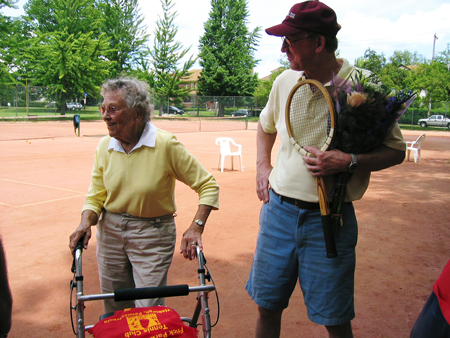 Dorothy Current (L) with her son Tom Current (R), a Pittsburgh resident and club member (Photo by Maureen Collins). 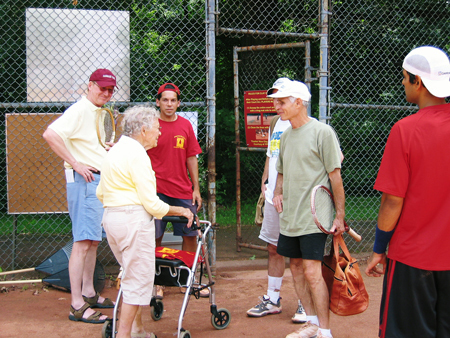 Dorothy Current (2nd from L) speaks to Jeff Winicour (5th from L). Photo by Maureen Collins. Maureen Collins presents Dorothy Current the Official FPCCTC Club Towel. 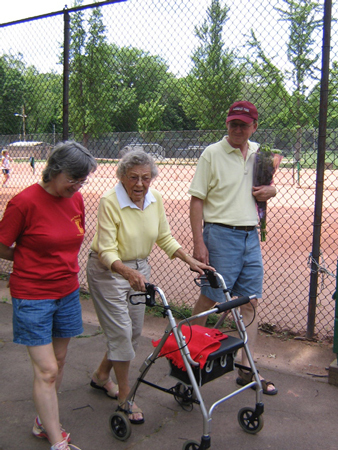 Maureen Collins (L) speaks with Dorothy Current (center) as Tom Current (R) looks on.